Well hello, hello! Have I got a fun post for you! We may be saying goodbye to summer, but I’m saying hello to camping season! I know everyone has their favorite time to go camping and some people even camp year-round. But my favorite time of year is fall. Of course since moving to California, I’m sure I’ll be able extend that time by quite a bit. You see, living in D.C., and then a few years in Atlanta – camping in the summer meant lots of bugs, enough mosquitos to put you in the danger zone of contracting some exotic mosquito-borne illness, and what I consider even worse… nights so hot and humid you would wake up in a sleeping bag soaked through with sweat – yet you still felt the need to stay under the covers to protect you from those pesky mosquitos still flying around in your tent. Personally, I much prefer relatively bug-less and cool nights when laying my head down to sleep. Hence, my preference for fall camping. Since moving to California, my cousin (who lives in Washington) and I have been talking about a camping trip. We finally decided to meet about halfway in Sunset Bay State Park, Oregon. I was assigned to food detail. 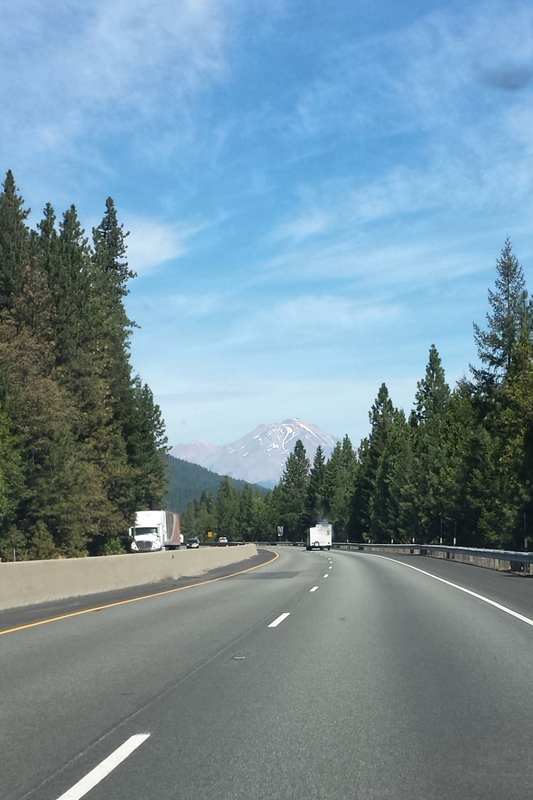 The easy part – we were car-camping; meaning you can load up your car with all sorts of gear, coolers, and all the bottles of wine you want. 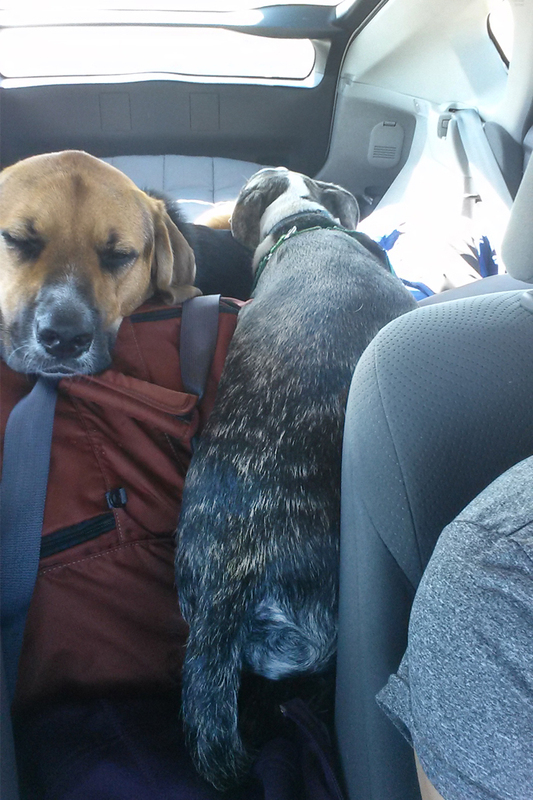 Unlike the name sounds, car-camping doesn’t mean that you pull up to the campsite and sleep in your car. Car-camping is simply setting up a tent and sleeping by your car. So instead of backpacking into the wilderness with only what you can carry, you can pack as much as your car will fit. As I said, ‘carrying’ the food was the easy part. The challenge was… the menu had to be vegetarian-friendly. The notion seemed a bit daunting at first. But then I thought… this won’t be too difficult. I’ve got plenty of veggie/camping-friendly recipes. Plus, it might not be such a bad thing considering our method of refrigeration would be entirely relegated to a cooler full of melting ice. Prep and portion all of your ingredients while you’re at home – chop all of the veggies that you can and combine all of the spices for each meal into one bag (be sure to label each bag). To minimize packing space and weight, I filled a travel-size bottle with olive oil for cooking. Use this method for any other cooking oils you may want to bring. Be sure to bring a pot, pan, small knife, cutting board, large wooden spoon, pot holder, salt and pepper shaker, bottle opener, can opener, trash bag, zip-top bags, napkins, kitchen towel, sponge, cups, plates, utensils. Extras you may want to bring: instant coffee, tea, sugar, evaporated milk, wine, and beer. 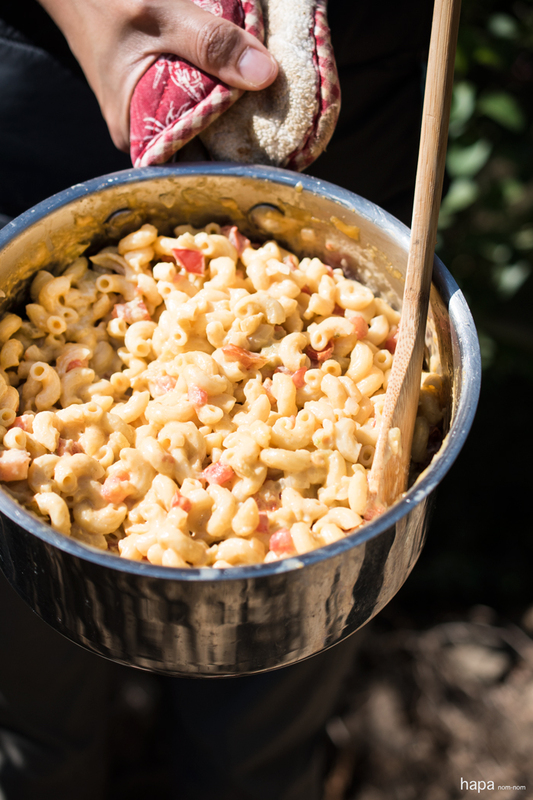 Camping Mac n' Cheese is super quick, so easy, and only uses one pot! Have an incredible dinner in the great outdoors in under 10 minutes! Heat the cheese, green chilies, evaporated milk, onion, cumin, and salt, over low heat, stirring constantly, until the cheese is melted. Add the macaroni and stir to combine. Once the pasta is heated through, incorporate the tomatoes. Portion into bowls, sprinkle with crushed tortilla chips and cilantro, serve and enjoy! Portion out the cumin and salt and place into one bag. 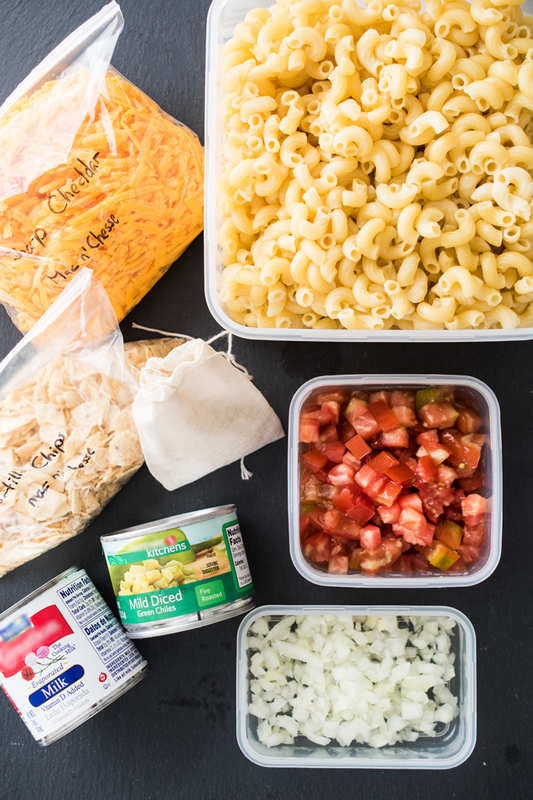 * 10 minute time is based on prepping these ingredients prior to your camping trip. Can’t wait to try this while camping next week! That’s great, Tim! Hope you have a great time! We’re hoping to make another trip in September. I love camping too, and fall is such a beautiful time to go. Last year we took a road trip from Vancouver, BC (home!) down to the Grand Canyon and camped along the way. It’s hard to pick a favourite spot from that trip, but the Oregon coast was definitely at the top of our list. Oh, Kristen – I would love to see BC! I’ve heard it’s just stunning! And I bet there’s some really fantastic camping around there. I hope you enjoy this mac n’ cheese on your next outing. Have a lovely weekend my dear. What a gorgeous view and girlfriend that is one gourmet menu for camping! I understand that making it vegetarian adds an additional complexity to the weekend. Your furry friends are so very cute and that view is stunning. That is such a great idea to use condensed milk when you are camping so you do not need to worry about refrigeration. Sorry I have not been around lately lots of technical issues with computer crashing, etc… trying to make my rounds… Happy Camping! Wow, what a beautiful coastline, Kathleen! And I sooo love how ambitious you were with your camping recipes. Your cousin was incredibly lucky to have you cooking for her on your trip! Camping in England is an ‘interesting’ thing – you generally spend all night shivering in your tent – but it sounds like Australian camping is a bit more like Californian camping. I can’t wait for my husband to introduce me to it! Thanks, Helen. My cousin went to culinary school so the pressure was on to impress. Thank you my dear 🙂 If you go, let me know where you go camping! Since moving out west, I’m on the look-out for great camping spots! Ooo… I spent a summer in Stowe and the hiking was just gorgeous! Can’t wait to hear all about your trip – you’re going to have so much fun! HA! Well you know the feeling is mutual 😉 I hope you had fun on your camping trip – can’t wait to hear all about it! Thanks, Cailee! We really did have a great trip! I stay organized out of necessity – otherwise I would seriously be all over the place! Hope you have a great weekend! Oooh, I love it! We got ourselves a little camper this year and have the logistics worked out just about perfectly by now, except for the food. Smoked salmon with capers and baguette is the only dinner I’ve come up with so far. These mac and cheese look like an easy and very delicious alternative! Ooo… I LOVE smoked salmon with capers! No seriously, I adore it! Darn it, I should have brought that! The Swede in me can’t get enough smoked salmon and I was camping with my cousin on the Swedish side of my family too – ugh… that would have been perfect! I’m definitely bring that next time! Kathleen, I love this post!!! I was supposed to go camping this summer but time escaped us so we’re going sometime next year. anyway, our dear friends are in WA and she mentioned going somewhere in Oregon! looks like so much fun and love this menu. . esp the mac n cheese!!! delicious! Thanks, Alice 🙂 I certainly hope you get a change to go next summer! I highly recommend camping in OR – the coastline was simply stunning! Hope you and your family have a great weekend! It looks like you had a great time and ate very well. The mac and cheese looks very nice. I never thought of using evaporated milk for mac and cheese. Great idea! We are going to Wisconsin 🙂 Thanks again for the inspiration! Have a great weekend ! Oh! Hello to camping season! How comfy and delicious this Mac n cheese looks, Kathleen. Sounds just perfect for any meal.